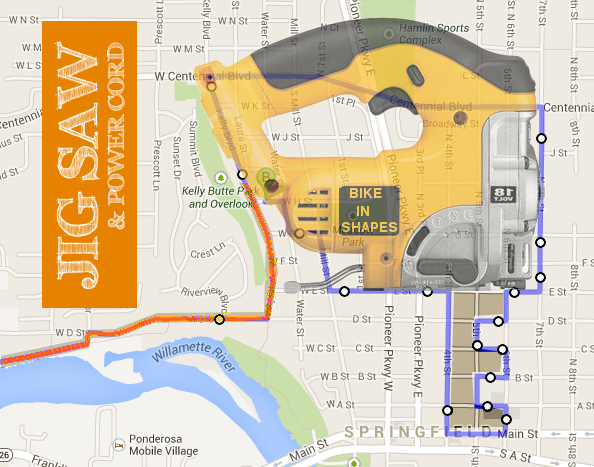 Puzzle me this…this Thursday will be BikeInShapes first foray into Downtown Springfield! We’ll be visiting one of the new “springs” of Springfield, Plank Town Brewing Company. Let’s meet this Thursday at 7pm on the Autzen Footbridge, and trace the “power cord” along the river to the “jig saw.”(Click on Calendar for full map). We’ll end at Plank Town Brewing Company (4th & Main). All are welcome & thanks to Plank Town for $1 off pints and appetizers!